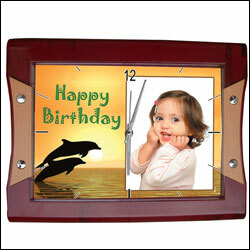 Customised Wall Clock (for Kids) : Convey your special wishes to your dear one by gifting this beautiful Wall Clock with photo laminated in it with " Happy Birthday" Message. 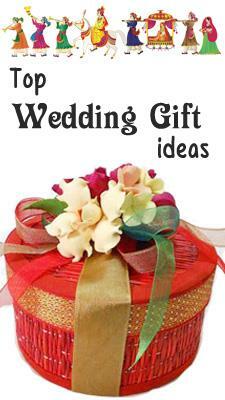 size: 34 cm x 29 cm NOTE: LEAD TIME FOR SHIPPING: 2 to 3 WORKING DAYS. Pls send the photo soft copy to support@us2guntur.com along with order no. 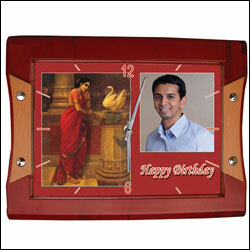 Customised Wall Clock with Ravi Verma Painting (For Him) : Wish your dear one with these special customised wall clock which comes with laminated photo along with Ravi Verma Painting. 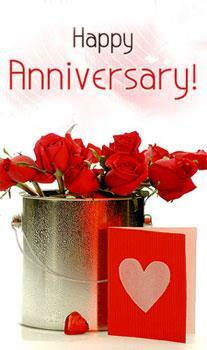 And the Message will be " Happy Birthday". 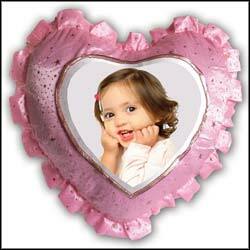 size: 34 cm x 29 cm NOTE: LEAD TIME FOR SHIPPING: 2 to 3 WORKING DAYS. Pls send the photo soft copy to support@us2guntur.com along with order no. 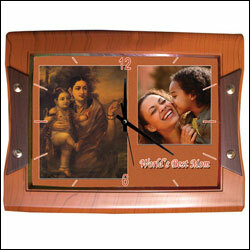 Customised Wall Clock with Ravi Verma Painting (For Mother) : Wish your dear one with these special customised wall clock which comes with laminated photo along with Ravi Verma Painting. 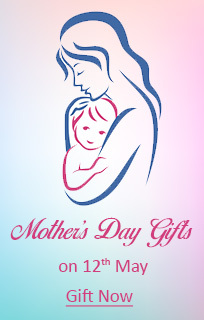 And the Message will be " World's Best Mom". 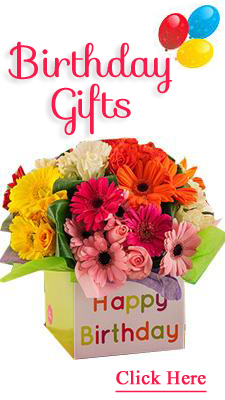 size: 34 cm x 29 cm NOTE: LEAD TIME FOR SHIPPING: 2 to 3 WORKING DAYS. Pls send the photo soft copy to support@us2guntur.com along with order no. 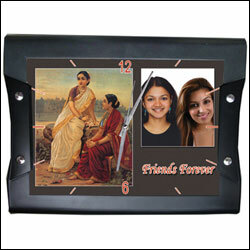 Customised Wall Clock with Ravi Verma Painting (For Friends) : Wish your dear one with these special customised wall clock which comes with laminated photo along with Ravi Verma Painting. And the Message will be " Friends Forever ". 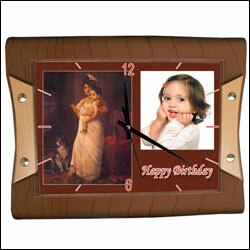 size: 34 cm x 29 cm NOTE: LEAD TIME FOR SHIPPING: 2 to 3 WORKING DAYS. Pls send the photo soft copy to support@us2guntur.com along with order no. 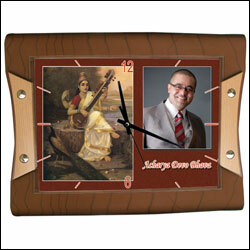 Customised Wall Clock with Ravi Verma Painting (For Teacher) - Wish your dear one with this special customised wall clock which comes with laminated photo along with Ravi Verma Painting. And the Message will be "Acharya Devo Bhava". 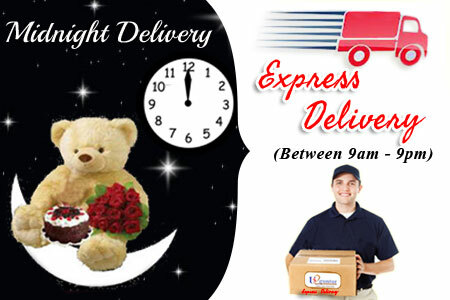 size: 34 cm x 29 cm NOTE: LEAD TIME FOR SHIPPING: 2 to 3 WORKING DAYS. Pls send the photo soft copy to support@us2guntur.com along with order no. 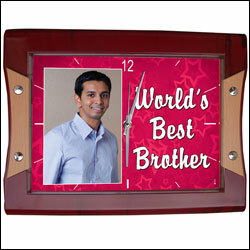 Customised Wall Clock (for Brother) - Convey your special wishes to your dear one by gifting this beautiful customised Wall Clock which comes with the message "World's Best Brother". 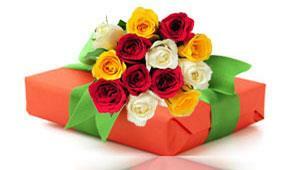 size: 34 cm x 29 cm NOTE: LEAD TIME FOR SHIPPING: 2 to 3 WORKING DAYS. Pls send the photo soft copy to support@us2guntur.com along with order no. 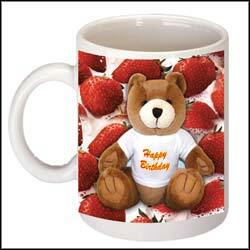 Convey your heartly feelings to your dear one by gifting this beautiful Mug with Photo on it. 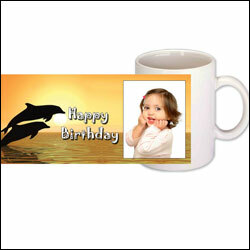 Color of Mug:white NOTE: LEAD TIME FOR SHIPPING: 2 to 3 WORKING DAYS.Pls send the photo soft copy to support@us2guntur.com along with order no. 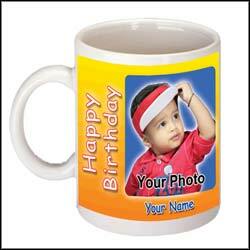 Customised Magic Mug (for Kids) - Convey your special wishes to your dear one by gifting this beautiful magic Mug on this special occasion. 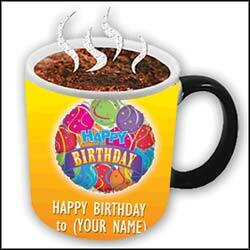 The speciality of this unique gift is when you pour something into the mug then only the image on the Mug will be displayed. 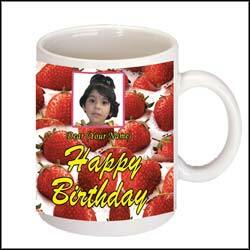 Customised Mug with Message (for Kids) - Make your dear one even more happy by gifting this beautiful Mug with Photo and message on it. The Mug will be coated with color from inside. 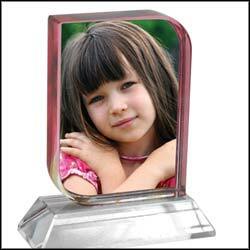 Customised Crystal Aspire - Convey your special wishes to your dear one by gifting this beautiful Crystal stand with photo laminated in it. 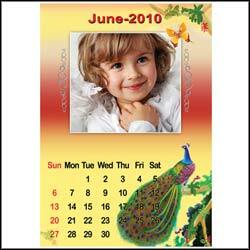 Customised Calendar (for Kids) - Convey your special wishes to your dear one by gifting this beautiful Customised Calendar on special occasions. Wall Mount, Size -A4, Photos required- 12.